Tesla deserves credit for pushing the world in the direction of electric cars. Following Tesla’s success, established automakers have lined up their own electric vehicles. Besides pricing, the biggest concern of buyers is the range when purchasing an electric vehicle. When you are on a long-distance journey, you constantly look at the remaining charge and the location of the nearest charging points. This behavior has been nick-named “range anxiety.” Here we take a look at the top 10 electric cars with the longest range that could alleviate your range anxiety. The range of an electric vehicle depends largely on the battery capacity and the weight of the vehicle. However, the range you get will also depend on the speed, wind resistance, outside temperature, and the use of air conditioning or heater. The ranking below is based on the official range figures. The Chevrolet Bolt EV offers a combined EPA-range of 238 miles. It is one of the cheapest electric vehicles to offer a range of above 200 miles. The Bolt EV has a starting price of $37,500, only about half as much as Tesla Model S. It supports Android Auto and Apple CarPlay. The new Nissan Leaf E+ has an official range of 239 miles. It’s the longer range version of Nissan Leaf, which had a range of up to 150 miles. The real-world range is expected to be above 200 miles. Premium automaker Audi has its own E-Tron electric vehicle with a range of up to 249 miles. It comes with three motors that collectively produce 320kW of power and 800Nm torque. It also supports all wheel drive (AWD). Audi claims the vehicle could fully charge in just 30 minutes with a DC fast charger. It boasts excellent build quality and gorgeous looks. This SUV crossover from South Korean giant Hyundai has a range of up to 259 miles. It has an impressive 64kWh battery that takes less than an hour to charge up to 80% using a fast charger. If you are plugging it into a standard electric socket, it’s going to take up to 10 hours to charge. The Hyundai Kona Electric is also far more affordable than Tesla Model S or Model X. This beautifully-designed electric vehicle from Mercedes offers a range of up to 280 miles. In real-life, you can expect a range of anywhere between 220 miles and 250 miles. The eNiro is an electric version of Kia Motors’ Niro compact SUV. With a battery of 64kWh, it can get you up to 282 miles between charges. The battery takes just 45 minutes to charge up to 80% using a 100kW fast charger. Its sales have been so strong that the first year’s production has already been sold out. Tata Motors-owned Jaguar’s all electric vehicle iPace delivers up to 292 miles of range, earning a place among the world’s top 10 electric cars with the longest range. In real-life conditions, you can expect up to 250 miles of range. The SUV can go from 0-60mph in just 4.5 seconds. It takes just 40 minutes to charge 80% using a fast charger. This is the most affordable car offered by Tesla. Despite its lower price, the mass-market Model 3 doesn’t compromise on range. Its Long Range version can go up to 325 miles between charges. The Standard Range Model 3 gets you a range of up to 220 miles. It’s one of the most refined and most affordable electric vehicles in the market right now. The flashy Tesla Model X with falcon-wing doors is an expensive car, but it has an impressive range. It comes in 75D and P100D variants. The Model X offers a range of up to 351 miles between charges. Given Tesla’s strong network of charging stations across the United States, you won’t have to worry about running out of battery power if you ever go on a cross-country tour. The electric vehicle with the longest range is Tesla Model S. It can get you up to 393 miles between charges if you choose to buy the 100D variant of the sedan. Tesla also offers a 75D version. 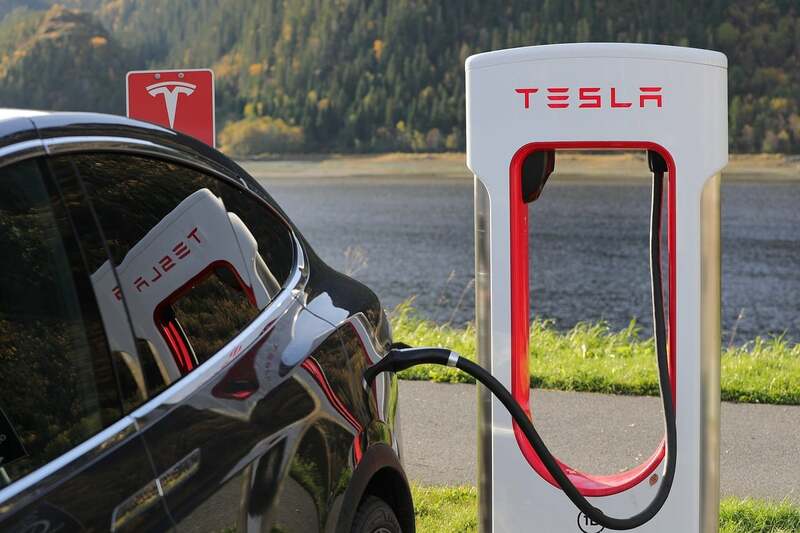 You can charge it from 0-80% in just 40 minutes using Tesla’s Supercharger network.